If I am correct, the 13th day of the brighter half of Chaitra fell on April 2 or 3, 2015. The day was once dedicated to Kama, the God of Love and known as Madanotsav or Kamotsav (Festival of Madana/Kama aka Festival of Love). The festival – which usually took place in a grove on the outskirts of a town – occurs quite often in Sanskrit plays. 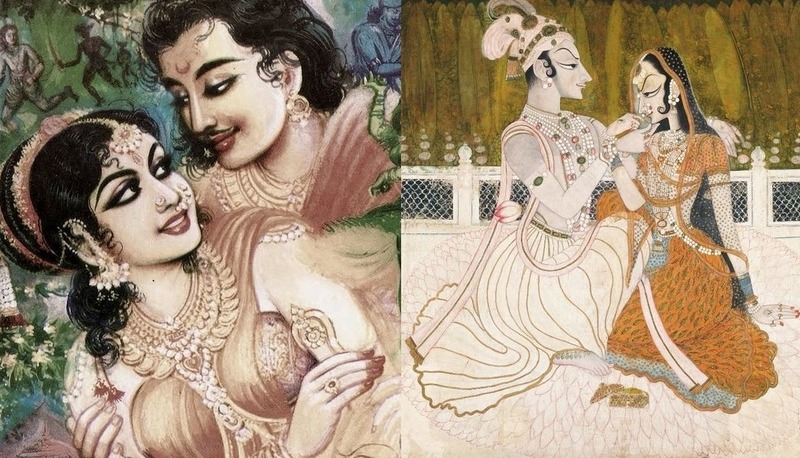 In Mṛcchakaṭika and Maltimadhava it is the day on which the lovers first meet, both texts describe the festival. It is also mentioned in records of Akbar’s time and there is mention of the festival in Udaipur in the 19th century. The festival was also celebrated in the South of India as Kaman Vilavu. 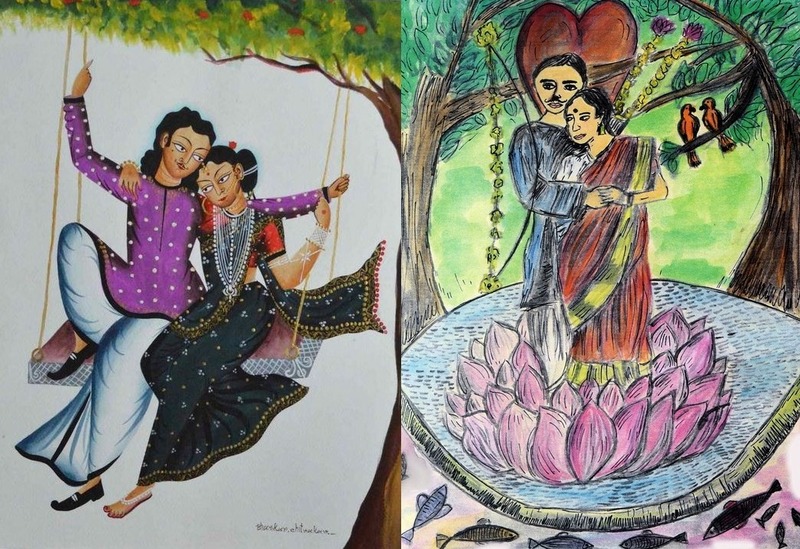 Despite its seemingly widespread nature, fairly early on in the country’s history it was largely replaced by Holi as the significant spring festival. Along with this a shift from the worship of Kama and Vasant (spring, Kama’s companion) to Krishna also took place, there are in fact no surviving Kama temples. Given the spring association, Kama is usually represented with a sugarcane bow, a bowstring of bees and arrows tipped with flowers. 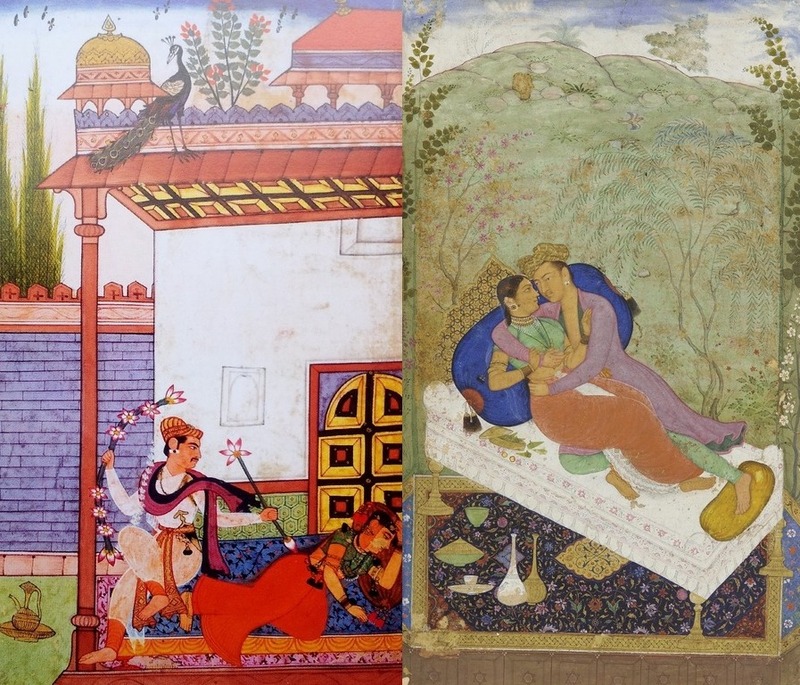 3 & 4: Vibhasa, a dawn ragini, where the man is usually represented as Kama. 5: Modern Kalighat by Bhaskar Chitrakar. This entry was posted in 1610s, 18th century, Ancient India, Contemporary, early 18th century, indian art, indian festivals, Indian men, Indian Women, miniature paintings, Romance and tagged ancient india, Bhaskar Chitrakar, Indian Art, kamadeva, love, love in Ancient India, love in India, madan dev, maltimadhava, miniature painting, mrchhkatika, radha krishna, sanskrit literature, Vibhasa Ragini, yavana rani. Bookmark the permalink.